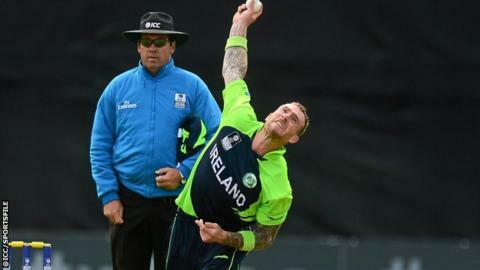 Ireland booked a place at next year's World Twenty20 and ended Jersey's qualification dreams with a dominant seven-wicket win at Malahide. Jersey captain Peter Gough hit 42 but they collapsed from a promising 106-2 to 122 all out, with John Mooney's hat-trick wrapping up the innings. Paul Stirling's half-century set the hosts on their way to victory. With Papua New Guinea and Namibia both losing on Sunday, Ireland won Group A to qualify for Saturday's semi-finals. The semi-finalists in the qualifier in Ireland are guaranteed progression to the tournament in India along with the fifth and sixth-placed teams. John Bracewell's Irish side suffered surprise defeats by Papua New Guinea and Hong Kong earlier this week. Ireland, Papua New Guinea, Hong Kong and Namibia all went into the final day of Group A action with a chance of finishing top and automatically booking a spot in next year's tournament in India. Jersey and the USA knew they needed wins to have a chance of keeping their qualification hopes alive and going through to this week's play-off games. Despite the win, Ireland might still have been facing play-off games in order to qualify for India. However, Papua New Guinea slipped to an 18-run defeat by the USA later on Sunday and Namibia's 83-run defeat by Hong Kong left Ireland as group winners. Hong Kong pipped Namibia and Papua New Guinea for second place in Group A on net run-rate although they now will be involved in a series of play-offs as they aim to join Ireland and Scotland in next Saturday's semi-finals in Dublin. The tournament is the most high profile at which Jersey have ever competed, and they were put into bat first by Irish skipper William Porterfield. Wicketkeeper Ed Farley and Gough started steadily but Farley was caught by Kevin O'Brien at long off for 21 to leave the Channel Islands side on 42-1. Rising star Jonty Jenner, 17, hit one huge six on his way to 26, before going lbw to the bowling of Stirling (3-16) and that sparked the collapse, with Jersey losing their final eight wickets for just 16 runs helped by Mooney's hat-trick in the final over. In reply, Porterfield (17) was dropped at slip by Gough in the first over as the Irish went on to reach to 44-1 from five overs. Stirling brought his 50 up from 34 balls but went soon after, caught by Jenner off the bowling of Ben Stevens, but Andrew Balbirnie's run-a-ball 32 saw them to the target with more than three overs to spare.